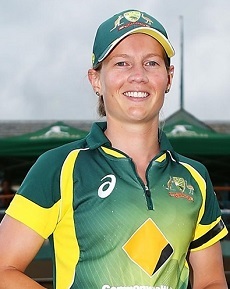 Commonwealth Bank Southern Stars captain Meg Lanning has been named the inaugural Leading Woman Cricketer in the World by the iconic Wisden Cricketers’ Almanack. In its 151st year, 2015 marks the first time the English cricket magazine has had a designated women’s award, with Wisden Editor Lawrence Booth lauding the performances of the Australian superstar. Meg had an exemplary 2014 in the green and gold, tallying 490 runs at an average of 49.90 in one-day international cricket and a peerless 625 runs at 52.08 with a strike-rate of 145.34 in Twenty20 internationals. Those runs broke the record for the most women’s T20 international runs in a calendar year, surpassing Englishwoman Sarah Taylor’s 616 in 2012. Meg also became the youngest ever Australia captain – male or female – when she took over from Jodie Fields in 2014 at just 21 years of age. She went on to lead the Southern Stars to a third-successive Women’s World T20 crown in Bangladesh as well as series sweeps over Pakistan and world No.2 West Indies at home.